The Lawful and The Prohibited is a structured 6-month programme designed to provide students with the essential rulings and evidences for everyday life in the modern era. This course forms a part of Al-Salam Institute’s Islamic Scholarship Programme and contributes to the student’s holistic training by providing an in-depth, practical handbook; a go-to guide for answers concerning the customary issues of day-to-day life – especially for Muslims in the West. There exists a range of circumstances (duties, obligations and expectancies) that are common amongst all Muslims. Beginning with the essentials of personal, individual matters, The Lawful and The Prohibited series will provide answers to critical questions such as, ‘what can Muslims eat and drink?’, or ‘how should a Muslim dress?’ Manners are as central to the everyday life of a Muslim as finding the ideal work/life balance. This unit will address these matters that the majority of Muslims will face at some point during their lifetime. This unit details the personal responsibilities that a Muslims owes in a wider context, namely, in marriage and family life. The respective rights and duties in the family home form the backbone of any upstanding and moral society. Issues such as permanent and temporary contraceptives, registration of marriages and divorce, and adoption in Islam have all taken a prominent role in the discourse of this social contract. Definitive answers to these issues – ie. understanding their limits and injunctions – are key to a successful and blessed marriage. Following on from the parent-child relationship in the previous unit, this unit will highlight the problems faced in contemporary education systems and will endeavour to provide Islamic solutions to these issues. It will also be discussed the fact that we have moved from simple sports and board games, to a near endless supply of movies, television programmes, music and similar entertainment. The sharp increase in the quantity and accessibility of these modern day phenomena may serve to obscure the objective of recreation – of leisure, entertainment or ‘down-time’ – in Islam. This part of the series will bring this objective to the fore, set out the criterion for ‘good’ and ‘bad’ types of recreation, and apply the prophetic model to the modern era. The next part of the course is concerned with Islamic Finance – including banking, economics and developments in the financial sector that affect (or will soon affect) day-to-day living. Student loans, mortgages, insurance, and borrowing on interest are all a significant part of the modern society, and by extension a significant choice that a person or a family will face at some point. Graduates of the Islamic Scholarship Programme will often be faced with providing advice to such people on these issues; so it is imperative that the human conditions of Islamic finance are understood as deeply as the Islamic perspective on them. Unit 5 of the series covers the lawful and the prohibited in the widest context: on a national and international scale. How should a Muslim or a Muslim family interact with the society and neighbourhoods in which they live? Muslims under non-Muslim rule must find the balance between tolerance and steadfastness, leniency and the inviolability of honour. Muslims are encouraged to attract others to the religion by their speech and good conduct, whereas performing actions in order to please the creation is blameworthy. Finding and adhering to this balance requires proper knowledge of the time as well as of the first application of Divine Revelation (ie. the sunnah of the Messenger saw). The fifth part of the series will detail the role of the Muslim community as a whole to the world at large. There are many opportunities for Muslims in the West to call to the religion; from colleagues in the workplace, associates in the classroom, neighbours, friends, community members, family members, and even online communities. The introduction of instant messaging and global online networks means that there is an almost limitless potential in spreading the message of Islam. How then can we ensure that we are following the way of the Prophets and Messengers? In this course on the Fiqh of Dawah, students will cover the proper methods in teaching the essence of Islam and in conveying its message to others. Onsite: Onsite students are those who choose to attend the lectures in person in London. The benefit of attending onsite enables students to study directly from the teacher and benefit from the learning environment. Online: Online students are those who cannot commit to onsite attendance for each course, or who would like to make use of the additional 5 days recorded access. The classes are streamed live at high-quality and are interactive; students can fully participate in the classroom discussions. On-demand: On-demand students are able to make use of onsite, online live, and an additional 30 day recorded access for all six units in the course. All students will receive a Certificate of Attendance upon completion of the course. The Certificate in Applied Islamic Law will be awarded upon satisfactory completion of The Lawful and The Prohibited course. Students of the programme may opt in to be tested on their understanding of the materials covered in an open-book exam to be sat at the completion of the course. Students will be issued a transcript of their results and can request an academic reference from the Institute. Credits are transferrable for entry onto the Islamic Scholarship Programme. Students of the Islamic Scholarship Programme are able to opt in for this additional qualification at any point during the Intermediate level. 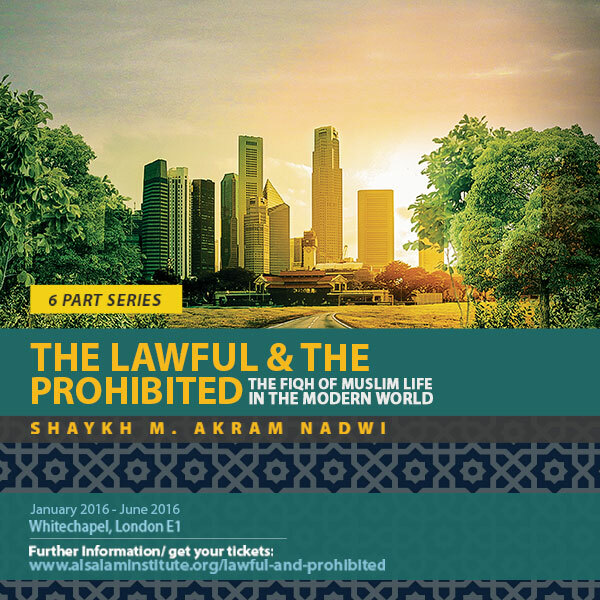 This unit is the first in The Lawful and The Prohibited series on the role of Islamic Law in the 21st Century. Students will be introduced to the 6-month programme and will follow a structured syllabus which will cover the fiqh essentials of the modern era. This unit will cover an array of topical areas, ranging from the Ahkam (rules) of the fundamental beliefs in Islam to the day-to-day dress code for believing men and women. The emergence of modern medicine will be covered in-depth, in addition to an introduction to the role of the individual in the family home. This unit looks into the respective requirements, rights and duties of individuals in a marital relationship. The common issues that are associated with marriage in the modern era will be analysed from a social and legal perspective, and the essentials of Islamic law pertaining to family life will be covered in this intensive one-day seminar. The course is essential for those who are seeking to get married, seeking to bring their marriage closer to the prophetic example, and those of a marriageable age as part of their preparation for marriage. This unit will cover the lawful and the prohibited relating to how an individual spends his or her free time. Examples will be drawn from the biographies of the earlier generations in order to demonstrate how the first, second, and third generation of Muslims interpreted the Ahkam relating to recreation and entertainment. Closely connected to this is the importance of proper training and education in Islam – which will also be covered in –depth in this unit. Practical suggestions in how to avoid procrastination and heedlessness in spending ones time will be provided alongside the Quranic and Prophetic injunctions in this matter. The case of the traveller will also be studied meticulously to highlight the effect of modern transportation methods on the positions in Islamic law. This unit on Islamic Finance will look at the significance of contemporary economic systems in the everyday life of a Muslim. The variety of avenues stemming from this topic, including Islamic Financial Accounting, Islamic Insurance, Islamic Banking etc., make it a daunting topic of study for the beginner. Whilst the unit will touch upon the merits of Islamic banks and their relationship to conventional banking systems, the primary emphasis will be placed on introducing students to the practical benefits of finance and economics in Islam. This unit on Islam, State, and Society will provide detailed instruction on the role of the individual Muslim in society. The role of Muslims living in non-Muslim land, the importance of Da’wah (calling to Islam), and the rights of the neighbour will be discussed in-depth. Examples taken from the history of political Islam, from the time of the Four Khulafa to the fall of the Ottoman Empire, will be presented alongside the teachings of the Prophet (saw) to foster a deep understanding of the wisdoms behind Divine legislation. In addition, the emergence of a global “eco-friendly” perspective will be discussed; focusing on how the believer should respond at an individual level. This module will also cover Jihad and its conditions, and consider solutions to the contemporary issues of fundamentalism and intolerance. In this one-day intensive course on the Fiqh of Dawah, students will study the best way to call to Islam in the modern era. The course will highlight some of the common mistakes and pitfalls to avoid when giving dawah, and the true objectives of the dawah of the Prophets and Messengers (as).